With a couple exceptions, we hadn't heard much about Lenovo's Windows 8 plans until now. Okay, it teased the IdeaPad Yoga back at CES, and recently unveiled the business-friendly ThinkPad Tablet 2. But surely the company wasn't going to stop there, right? Hardly. Lenovo just announced the IdeaTab Lynx, an 11.6-inch laptop / tablet hybrid aimed at mainstream consumers. Like so many other products with this form factor, it runs a dual-core, Clovertrail-based Atom processor, paired with 2GB of RAM and either 32 or 64GB of solid-state storage, depending on the configuration you choose. Unsurprisingly, the detachable keyboard dock has a built-in 6,800mAh battery of its own, which promises to double the tablet's runtime from eight hours to 16. In this case, though, the machine benefits from Lenovo's keyboard know-how, so as small as the 1.45-pound dock is, it still offers an AccuType layout similar to what you'd find on Lenovo's bigger notebooks. Detach the tablet from its dock and you have a 1.4-pound tablet that measures 9.45mm thick. That 11.6-inch, 400-nit screen is of IPS caliber, so the viewing angles should be decent if you attempt to use it outdoors or watch movies from an odd angle (say, with the screen dipped forward on an airplane tray). Poke around the device and you'll find micro-USB and micro-HDMI ports, along with a microSD slot for external storage. It also has a 2-megapixel webcam up front for video chatting, though interestingly, there's no camera module on the back side. The dock, meanwhile, adds two full-sized USB 2.0 ports. According to Lenovo, the Lynx will be available in December, starting at $600 for the standalone tablet. The keyboard dock will be a $150 add-on.) Until then, we've got some early hands-on photos below, along with the usual spate of press shots. 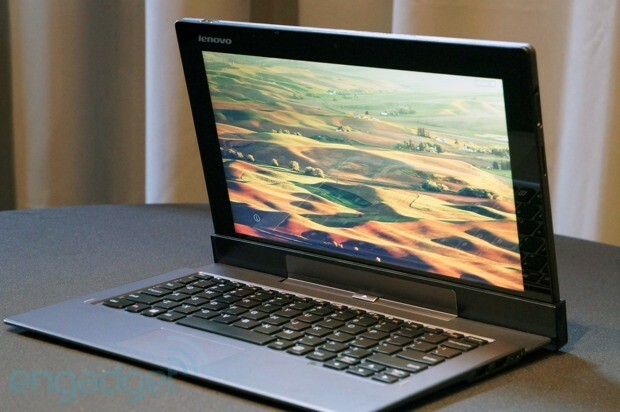 Lenovo IdeaTab Lynx: an 11.6-inch Windows 8 hybrid arriving in December for $600 and up originally appeared on Engadget on Tue, 09 Oct 2012 19:00:00 EDT. Please see our terms for use of feeds.